OK Jimmy... I am leaving it up to you again! 2 old reviews removed and changed for this one. That is ok... I think I can spare it! But which are you talking about... put that after 2 movies... Bay Cove and The Hallow! I've replace the one with Jennifer Gardner. Yeah... I don't think it will hurt me too much! Horror novelist Roger Cobb is a man on the edge, reeling from his recent divorce, haunted by the mysterious disappearance of his young son, and struggling with his new book about his traumatic experiences in Vietnam. But when he moves into the strange house left to him by his late aunt, Roger's precarious sanity comes under siege by nightmares of his dead war buddy, visits from a nosy neighbor, and an onslaught of hideous creatures from another dimension. Horror has found a new home, and it's fully furnished with murder, monsters and madness! William Katt (CARRIE, THE GREATEST AMERICAN HERO), George Wendt (CHEERS), Richard Moll (NIGHT COURT) and Kay Lenz (STRIPPED TO KILL) star in this outrageously scary horror hit, produced by Sean S. Cunningham (FRIDAY THE 13TH) and directed by Steve Miner (WARLOCK, HALLOWEEN: H2O). As you can see from the Overview... This movie has 3 TV Stars to make this movie relevant for this marathon. It has William Katt, George Wendt & Richard Moll. This is a fun Comedy-Horror movie. It is not perfect... but it is definitely entertaining. I really enjoyed George Wendt as the neighbor. Worth checking out for some non-sense fun. NOTE: Jimmy... there is another review for House by me available.. but this one has more info so you can just change the link to this one. I watched this movie for Jennifer Aniston (Friends) and Catherine Bell (JAG). I have already watched this one several times so I am surprised there wasn't a review up for it here yet. The first thing I noticed was that the DVD had trailers before the menu. Which is no big deal... but you couldn't bypass them by hitting the Menu button or then Next button. Best you could do is fast forward through them. The movie itself I really enjoyed. Definitely has some hilarious parts in it. And I think Morgan Freeman as God was great. Tim Burton's Corpse Bride carries on in the dark, romantic tradition of his classic Edward Scissorhands and Tim Burton's The Nightmare Before Christmas. Set in a 19th-century European village, this stop-motion animated feature follows the story of Victor (voiced by Johnny Depp), a young man whisked away to the underworld and wed to a mysterious Corpse Bride (voiced by Helena Bonham Carter), while his real bride Victoria (voiced by Emily Watson) waits bereft in the land of the living. Though life in the Land of the Dead proves to be a lot more colorful than his strict upbringing, Victor learns that there is nothing in this world - or the next - that can keep him away from his one true love. 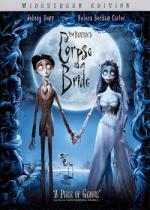 It's a tale of optimism, romance and a very lively afterlife, told in classic Burton style. I am watching this one in this marathon for 2 reasons. First it stars Johnny Depp who starred in the TV Series 21 Jump Street back in the '80s. And also because Brittany wanted to watch a movie with me. And I let her decide what she wanted to watch. And this was her pick. Tim Burton's Corpse Bride is a fun animated movie that is good for the entire family any time... but especially around Halloween. This is the first taste of Tim Burton's animation I ever had as I still never seen Tim Buton's Nightmare Before Christmas... but think I may have to see about adding it to my collection as well. I will say that there is a little too much music in this movie for my taste. But it is bearable. I still enjoyed it... I would have just enjoyed it more without the songs in it. NOTE: Jimmy... I already have a review for this movie... but this one is more detailed so you can just change the links so that it links to this one. This marathon could have been name the "Jimmy change the link marathon"
Well... Everything I watched this weekend I seen before. Besides... had to give you something to do on this lazy Sunday! It happened that way... but it didn't HAVE to happen that way. There is a few movies I own I never seen before that would have fit in the theme I chose.